RNC: The GOP’s Tampa convention may seem dull, but Republicans might not need excitement to win. 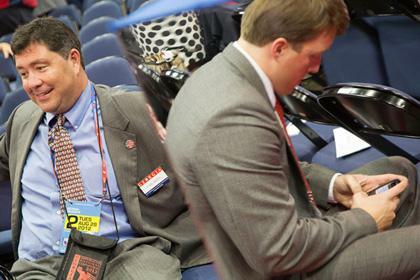 Is it a problem for Republicans that this convention is so boring? Maybe not. That observation about the rent-a-hacks working security is kind of fascinating. Four days into this event—only three days into the whole security gate/checkpoints/walking through Tampa’s soupy weather to get to speeches stuff—I’m amazed at the number of people who just come to conventions to hang out. It’s like what I imagine Davos to be, only at Davos you’re probably more likely to meet someone with a lot of money, and less likely to be pitched multiple times to write about a PR flack’s superboring tech widget. I take that back. I’m sure there are people at Davos trying to schlep tech widgets. That said, the word that keeps emerging when I catch up with Republican sources or bloggers or other carbon-based life-forms is “boring.” Josh Trevino, the RedState/Texas Monthly writer, came up to me in the Pokemon-ishly bright Google lounge to say that this was the dullest of the three RNCs he’d attended. If it’s a little duller this year, why? Isn’t it because these guys have no record to defend, and they can run against a bad economy? 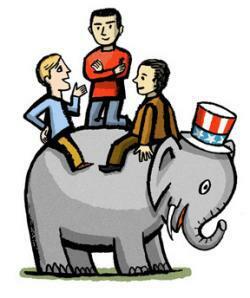 There’s no Iraq War angst to cancel out and no surging unemployment rate that can be pinned on their party. The excerpts from Romney’s speech have him promising “a future where everyone who wants a job can find one” and “where no senior fears for the security of their retirement” and so on—oh, and having wanted Obama to succeed, but being disappointed. It will not soar, it will not induce giddiness, but it doesn’t need to.